London Mayor Sadiq Khan is seeking new powers to ban wood burning in the most polluted areas of the capital. The mayor has written to the Environment Secretary Michael Gove asking for greater powers to tackle air pollution not caused by traffic. Mr Khan wants to introduce a network of "zero-emission zones" where the burning of wood or coal is completely prohibited. He also wants tougher controls on the sale of wood-burning stoves. 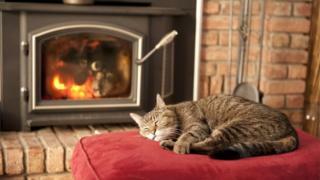 Under the mayor's proposals only low-emission versions of wood-burning stoves would be allowed to remain on the market. There are currently 187 areas of London where pollution regularly exceeds European limits. Mr Khan's plans also include curbing emissions from machinery on building sites, such as diesel-powered diggers, and boats on the Thames. Mr Khan said in a statement: "With more than 400 schools located in areas exceeding legal pollution levels, and such significant health impacts on our most vulnerable communities, we cannot wait any longer and I am calling on government to provide the capital with the necessary powers to effectively tackle harmful emissions from a variety of sources." A spokesman for Mr Khan said the proposals would include "very small zones to curb pollution caused by wood-burning stoves" by 2025. "It is one of a number of ideas and it would need legislation from government and it would be at least six years away from happening," they added. Under the mayor's plans, councils would get the power to enforce the ban, including the ability to carry out inspections and issue fines. But under the The Clean Air Act local councils can already set up Smoke Control Areas where only smokeless fuels should be burnt, or wood is burnt only in "exempt appliances". Homeowners can be fined £1,000, although there is no evidence anyone in London has been. Air pollution causes an estimated 9,500 early deaths a year in London and 40,000 across Britain. A new £10 "toxicity charge" is set to be introduced in October this year for pre-2006 diesel and petrol cars entering the London congestion charge zone. The Department for Environment, Food and Rural Affairs is due to publish a clean air strategy next year.